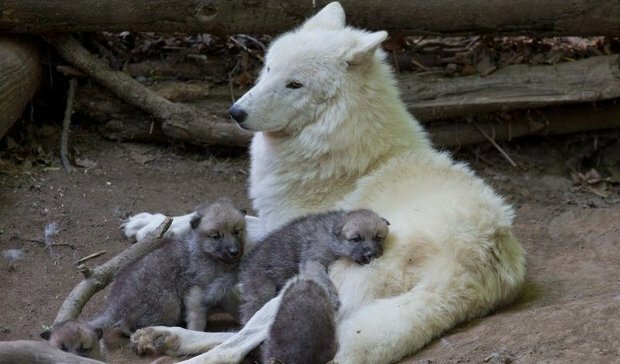 Earlier this year, on April 25, five Arctic wolf pups were born to a female living in captivity at Schönbrunn Zoo in Vienna, Austria. Although still very young and quite timid, the baby wolves were recently allowed to step outside their den and explore the outside world. Apparently, they loved and adored the experience. The video, posted online just a few days ago, shows the pups hanging about their enclosure. They seem to be having the time of their lives and keep sniffing the ground as if looking for a hidden treasure. They still nurse and will make the switch to eating meat when they are about three months old, Zoo Borns tells us. Meanwhile, they are totally depended on their mother for food and protection. “The pups are still very timid and only take very short trips from the building. For Inja, it is her fourth litter, and as an experienced mother, she takes very good care of her offspring,” Dagmar Schratter said in a statement. As they grow older, the Arctic wolf pups will ditch their gray coat and turn a perfect white. If in the wild, having white fur would have helped them blend in with their surroundings. Responses to "Watch: Adorable Arctic Wolf Pups Will Totally Make Your Day"